Changed title from "Best way to get 15 mm Tiznaos" to "Best way to get 15mm Tiznaos"
join chosen proposal and to lobby Lluís to push tiznaos on the head of the list. It's not an advert. It's a suggestion to join me in this effort. I believe Peter Pig are planning on doing some shortly. Yes PP are. Top secret at the moment though! BTW. Is there any way to suggest PP some additions to their offer ? I tried to e-mail them but to no response. No problems Brunton. i think the secret is safe between the two of us. Be careful using any manufacturer that will not give a geographical address! There is usually a reason they will not tell you where they are! SDD and Stronghold had street addresses for many years, but did they deliver? Address is no guarantee, and PayPal provides buyers some limited protection. Neither Peter Pig nor Minairons are on that list for me. Great service all around! I will withhold judgment of others until they demonstrate they are unreliable. And you are right with PayPal. I placed an order with infamous No Pasaran miniatures, got no service and finally got my money back through Paypal claiming service. Yes Jeff, traders who give an address can still be dodgy. However no street address is almost a siren of " i will not comply with the law". Traders who will not give an address do so for a specific reason ie I do not want to be found! They do not leave it off because they think you will never need it or they just forgot to put it on! Serious businesses always provide an address. Joke businesses never provide an address. I am testing Panzer Garage with a small 1/72 order, while I patiently wait to see what Martin offers in 15mm 1/100 and Luis in 20mm 1/72! AHA I caught you fools! …so conspirating in secrecy??? - Fiat SPA Dovunque 35 truck (design just started, so no pictures available yet). BTW Martin: have you ever thought of sculpting some 15mm vehicle drivers and passengers of both sides? Ones that could be fit onto those vehicles of your 8 range also suitable for SCW? Yes a good idea. I will get my work hands on!!! I am testing Panzer Garage with a small 1/72 order! Would be very interested to know how that goes, jhancock. Some attractive Vulcano, MTM and Torras tiznaos as well as the decals! To my regret, I missed out on the SDD 1/76 tiznaos that covered the Durruti Column vehicles (apart from Torras 2 "King Kong" from Bandera but no longer available and also in need of major correction). I've got no axe to grind with any 15mm maker – my SCW collection is strictly 20mm; but Panzer Garage has a street address in Madrid – it's on their website and I'm not sure why anyone would want to suggest otherwise? The guy there is very helpful and very quick dealing with enquiries. I've been very impressed.Like jhancock I've sent in an order. My first Panzer Garage order of 1/72-20mm Tiznaos arrived in the US today from Spain only 11 days after being shipped! My first Panzer Garage order of 20mm Tiznaos has arrived in the UK today four days after shipping. I have been very impressed with the service and the quality of the models and will definitely buy more in future. Highly recommended. I hope that Luis at Minairons will follow suit and add different Tiznaos to the range. 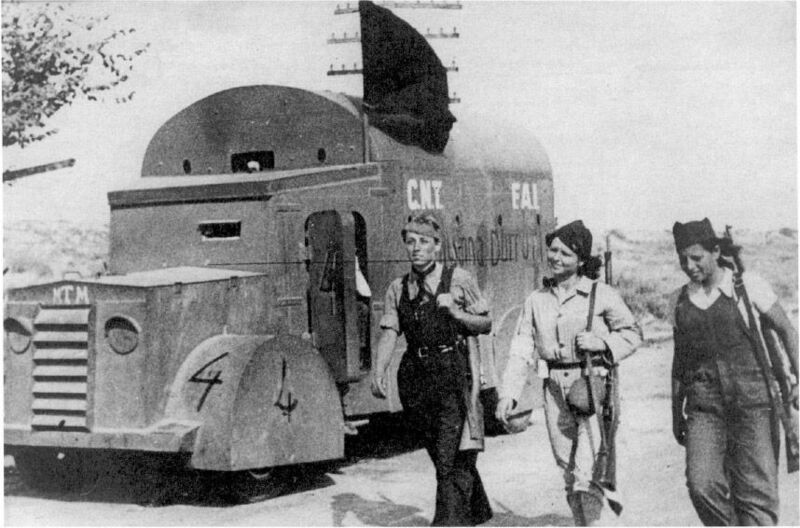 It's Black Lion Decals that make 1/72 decals for the Durruti Column MTM-1; but I too hope either Panzer Garage or Minairons will release the 1/72 model! Still hoping 17 months after your post…. Not sure if you have come across my later post on options for the MTM-1? Also hoping for more tiznaos! I had missed that one, Mike, thanks for pointing it out. I'm not sure about card models – probably a reflection on my abilities rather than the original but if all else fails…I would like that MTM-1. But I've been very pleased to see that Panzer Garage have now made one of my personal favourite tiznaos, the nationalist mortar carrier. I must get that one soon.